Thank you for attending our workshop, Entertaining Angels. Our hope is that the workshop has started a conversation at your parish, with your pastor, about how you can better serve the guests and parishioners who walk through your doors. There is no way to change a culture through a single workshop – that is going to take time. Take your action plans back to your parish meetings and talk about the most important way you can enrich hospitality at your parish. It can be simple, but make it meaningful. One parish that we worked with started by purchasing a mini-fridge for their office reception area and stocking it with water and juice. They offered every guest something to drink and something small to eat. It facilitated a sense of calm, warmness, and opened the door to conversation. In American culture it is expected that we pay for our hospitality. Hospitality in the Bible is free, generous, and often accompanied by food. Read: Genesis 18:1-15 (Abraham & Sarah’s hospitality to three strangers). Did you read that passage above? It is almost startling how attentive to the needs of guests those in the Bible were. Would you open up your home to anyone who knocked on the door? What if they admitted they were a criminal just released from prison? 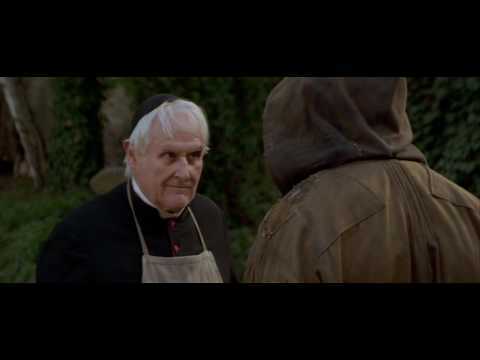 In the book (and movie) Les Misérables the convict Jean Valjean is released from prison and knocks on the door of a bishop. Bishop Myriel gives him shelter for the night, no questions asked. Valjean steals the bishop’s silverware and runs away but is later caught by the police and brought back to the bishop’s residence. Instead of sending him back to prison, he is immediately forgiven by the bishop who gives him the silverware and silver candlesticks on top of it. “Jean Valjean my brother you no longer belong to evil. With this silver, I have bought your soul. I’ve ransomed you from fear and hatred, and now I give you back to God.” After that, Valjean tries to live an honest life. He was shocked by the hospitality and mercy of the bishop. When we welcome a guest into our parish home, make them feel welcome, and offer them a place to rest, we also need to stop what we are doing and listen to them. “To listen is very hard, because it asks of us so much interior stability that we no longer need to prove ourselves by speeches, arguments, statements, or declarations. True listeners no longer have an inner need to make their presence known. They are free to receive, to welcome, to accept. The art of Christian listening is one of the most important aspects of hospitality that we can implement and something we need everyone in our community, staff and parishioners, to practice. Years ago, when I (Adam) was searching for peace and meaning in my own life I spent time exploring different Christian churches. I ended up joining the church that where I was treated as an old friend from the moment I walked in the door. It was easier to accept the obligations of the Gospel in a place where I was made to feel as though I belonged and that is the church where I fell in love with Jesus. Each month, starting next month, we are going to focus on a different aspect of hospitality. Listening & attentiveness. Hospitality for those with disabilities. Hospitality and beauty. Hospitality and culture. Hospitality and mercy. When a person feels at home at our parish and wants to be there, half the battle towards discipleship is done. For this month, we are including a copy of the handout packet if you need to make extra copies of your action plan. The challenge is to work through your action plan and set priorities. We would also like you to complete a short survey on the workshop. It includes an opportunity to share your prayer requests, as it would be an honor to pray for you.